SAT CHUEN HON, MFA, is a poet, a dancer and a healer. 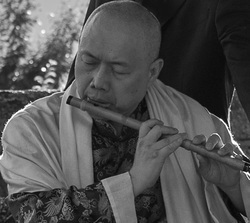 Trained in Medical Qigong,Taiji Quan and Classical Chinese Medicine, he received his certificates from Guangzhou University in TCM (China) and The Council of Colleges of Acupuncture and Oriental Medicine (USA), with a BS in Psychology from Princeton University and MFA in Dance/Movement Therapy from Connecticut College. He is the founder of the New York Dan Tao Qigong School and author of ﻿Taoist Qigong for Health and Vitality﻿ and Healing Cancer with Qigong. He is the president of Ancient Taoist Practice Society, Inc., a nonprofit cultural incorporation. He has studied extensively with Taoist masters: Sifu Ham King Koo, t Zhou Jung Hai, the Nan Hui Gen and Buddhist masters,Thích Nhất Hạnh, Abbot Shou Yu, Abbot Ming Guan as well as close to 200 teachers in various martial arts and spiritual healing. Now after more than four decades, he has come to his own path: Dan Tao, The Way of Transformation an integration of the spiritual healing of the Dragon Gate Complete Perfection practices.